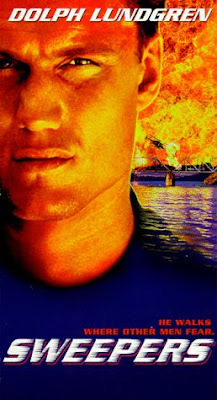 In this Nu-Image production, Dolph plays Christian “Ace” Erickson, an adventurous former U.S. Special Forces soldier who has found his calling in life as a member of the Humanitarian Order of Chivalry, a group that goes to war-ravaged countries beset by land mines and removes the offending mines. 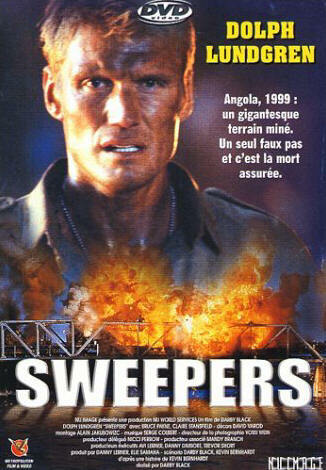 While on assignment in Angola, his young son is blown up by a mine. Distraught, Erickson becomes a drunk and abandons his mine-finding ideals. He resorts to punchfighting in the local watering holes for cash. 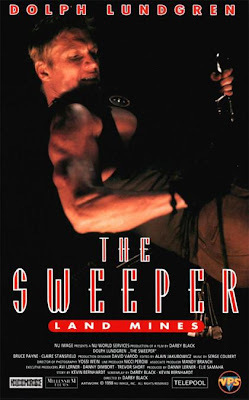 When a new, American-made super-mine, the “A-6 Butterfly” is unleashed on the populace, it’s up to Erickson and Michelle Flynn (Stansfield) to stop the madness and unravel the government conspiracy behind these deadly items, spearheaded by Dr. Cecil Hopper (Payne). Will they succeed? A Dolph Lundgren movie about land mines kills two birds with one stone. Firstly, it allows the viewer plenty of blow-ups with an actual reason behind them, and secondly, it’s a fairly original idea, especially for low-budget action movies. Think about it: the issue of mines in these third-world countries is a real, pressing problem. It’s a human issue many people care about. So when you add Dolph, who about 2/3 of the way through the film transforms into “Indiana Dolph”, complete with fedora-like hat and leather bomber jacket, it makes for a nice night for DTV fans. Dolph ventured back to Africa after his time there filming Red Scorpion (1988), and the rural locations and indigenous music make for a different sort of backdrop to the action. A lot of the action is fairly implausible, but when Dolph dons his “adventure hat” and is chomping on his cigar, who can argue? Especially since he seems a bit more animated this time around, which is always nice to see. Of course, the antithesis to his “adventure hat” is the “evil hat” of nemesis Yager (Roberts). This isn’t to be confused with the G.K. Chesterton-quoting baddie Hopper. In their off time, the Sweepers (you didn’t think this was a movie where Dolph plays an undercover school janitor, did you?) (because that would be awesome) play what can only be described as “mine games”, competitive events where they try not to step on mines. I wonder if this is accurate to how actual humanitarians behave? But then again it probably gets boring when you’re out in the country and your mine-hunting is done for the day, especially for a man of action like Erickson. So despite some of its sillier plot flaws, thanks to its important message and its difference in the world of DTV action, don’t be afraid to go on a “Mine Walk” with Ace and the gang. I really enjoyed this one too. A really fun Dolph flick. My one main issue was Bruce Payne with a New York accent. I never got that, why not have him speak with his native English one? Some questions can not be answered...Maybe Nu-Image forced him to change his voice. Their choices aren't always the best. Great one guys! Another one to add to my Dolph list!